They may be tasty invertebrates, but scientists are learning a lot about their eyesight. It turns out that their eyes are much more complex than previously thought. Scientists have long believed that scallops can see images, and even detect predators. Research published in the journal Science last year found that the eyes—hundreds of them line the edges of a scallops fringed opening—have a complex mirror made up of microscopic tiles that reflect light onto two retinas. It’s believed that this lets scallops see in front of them as well as their periphery. We learned a lot about new research on scallop eyes from this New York Times article. The paper in Science is worth a peek for the amazing microscopic imagery alone. We were reminded of scallops and their impressively complex eyes when we saw this fellow in the Eastport exhibit in the Northern Waters gallery. You can find scallops in several places throughout the Aquarium. The fellow above was spotted in our Gulf of Maine exhibits, the Eastport display to be precise. 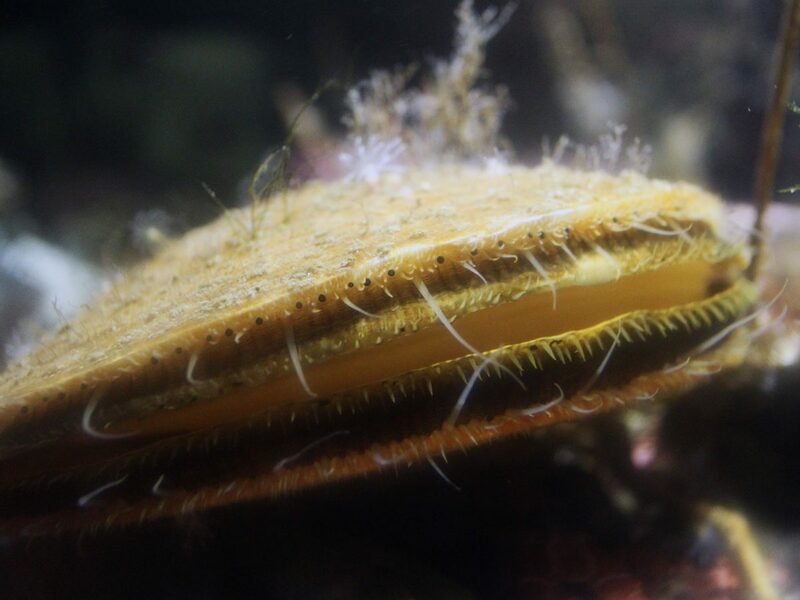 You can also see and touch a scallop in our Edge of the Sea tidepool touch tank. Take a look at their eyes, all 100+ of them. Check out this action from our tidepool touch tank.